Not sure of that Norman, certainly the Massey Shaw (the biggest one) was convention build. Just give the gogo girl a trowel! They don't use expanded metal lath on ferrocement boats to my knowlege -- usually they use multiple layers of chicken wire and/or metal mesh over a complex wire armature. That's more permeable. 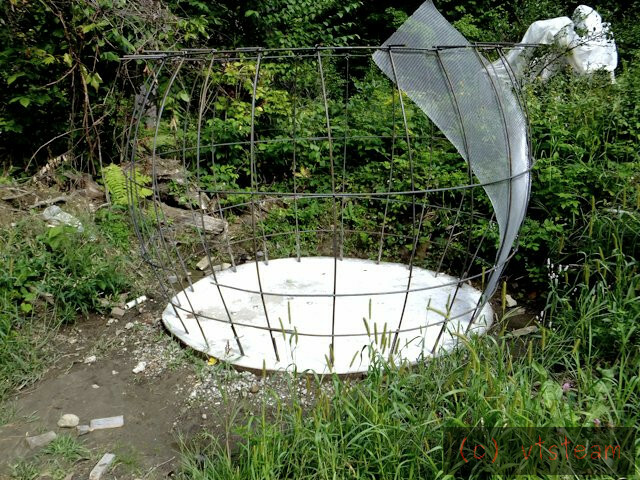 In this tank one layer of chicken wire goes outside and expanded metal lath goes on the inside and is fairly "opaque" to the plaster. Cups face up. Worms of plaster do squeeze through, but a rough surface is a benefit for keying a second coat. The inside is plastered first, then serves as a backing to the second coat outside. A third coat goes inside. That's for a tank. Boats are plastered at one go. Boats are relatively thin skinned for the volume, but exposed to high seas and gales, as well as mast and keel working stresses. A tank is stationary and weight and thickness isn't a penalty. One section has fewer horizontals to allow a temporary narrow acceess. It is closed and plastered up as late as possible. A permanent ladder is built into the tank for maintenance and safety. Naturally I barely got 2 horizontal rings bent and wired on temporarily today when it started to rain. I think it's starting to look more like it would have a darede\vil on a motorcycle than a 60's wood nymph inside. 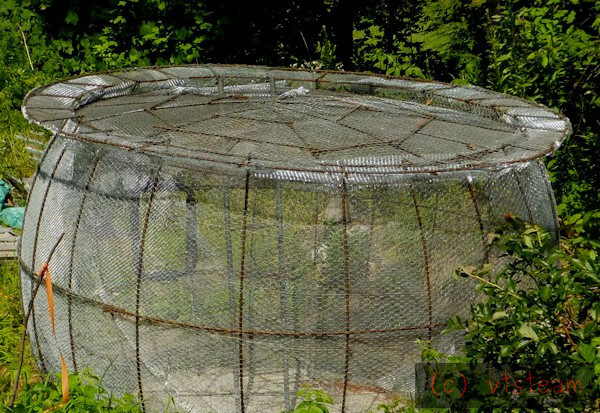 Talking of a woodland nymph cage - it made me think of the bumbee cages that we used to make as kids. Been going slower because of those gotta fix this tool to fix that tool to do this so I can do that chains of behavior. I was doing a few welds on the "waterball" as we've begun to call it using a new HF TIG machine plugged into a portable racket generator and let a little magic smoke out of the welder. Not enough to kill it, but a good scare. I started thinking about the Listeroid diesel generator right nearby, adjcent to the tiny shop which is adjacent to the waterball, and not having run it for awhile, decided to start it and check out the 240 volt output. I had to kill some wasp nests to get into the shed. A mouse had built a nest out of fiberglass insulation over the gen head brushes -- luckily a new nest, and not all urine soaked from last winter. The brushes and slip ring were fine and I cleaned them with alcohol. The diesel started right up and I had voltage on the meter. Went to check out the cooling system for a minute (radiator in the tiny shop, and overflow container). When I came back. No voltage. After awhile the culprit turned out to be a dead leg in a bridge rectifier, and I rectified that problem by knocking the old Chinese one out of its integrated heat sink, and fitting a new prime part -- fit the sink perfectly. The old rectifier, had only been glued in at a couple spots, and no heat sink compound. The new one was bolted in and compounded. It's a 25 amp vs the old 10 amp. Voltage came back, and i played around with the Listeroid, cleaned it up, did maintenance, and started thinking again about all the upgrades/improvements I'd wanted to make, and never did. I had cut some trees last week for lumber, and then decided I'd better saw them up before the bark got really glued down solid. I de-bark by hand before sawing, and it's best to de-bark right away. But had to change the band blade on the sawmill, and found I had one stuck guide bearing. Fixed that, and it turned out the new band was longer than my old ones, don't know why, ordered the same length from the same place. Anyway, this pointed out a problem I'd had all along with the tracking adjuster/blade tensioner (which I'd built 12 years ago), so I decided to take that apart and make it right. That worked fine even with the longer blade, but the square tube saw guide arms had become very tight in their sockets, and it took a hammer to shift them. So I decided to take those apart, and file them down so they slid nicey nicey, but couldn' t get the arms out because the ends were a little belled from the hammer, naturally. So I thought I'd bring up my tiniest generator a harbor freight 2 cycle 800 watt baby, easy to carry up the hill to the sawmill (which is outdoors near the woods and no electricty), and bring a small disk grinder to grind down the ends of the guide tubes so I could get them out of the sockets so I could file them so they would slide nicey nicey. But the generator didn't want to start, so I gave it fresh gas and oil mix, and pulled and pulled, no go, until I found a gas shutoff, which is kind of hidden. But it was set to on, so I thought, damn, I should have shut that off and let it run out, I bet the carb is a mess. But no, when I got my glasses, I realized this shutoff is backwards compared to most. Usually when the handle is inline that means gas flows. But with this one it meant shut-off. So I had shut it properly after all. So then I turned it the right way, and whaddya know......It started right up. So I ground the ends of the guide tubes, pulled off the guide bearing holders, etc. There are lock bolts so when you slide the guides over and out to suit a new blade, and the log width. One was missing, but the tube had been so tight it hadn't moved anyway. But I decided to replace the bolt. Well It stripped, apparently a bit of weld splatter had got in the threads from an earlier repair, so then I hunted up a tap and cleared the thread. After filing the tubes, the guides slid smoothly, the new bolt locked properly, and I reassembled the saw guides and put the blade on. I cut up a log, and then it was supper time. Oh I forgot, I also rebuilt the engine on a weird little log winch I own, built of sheet metal and oak and an ancient emergency brake -- I think it was originally used to haul ice fishing shanties off the river. It's sled shaped. Anyway the Briggs engine magneto had died and the gas tank had rusted. It's one of those old ones integral with the carb -- from the 60's. I found a replacement more or less similar on another junker engine I have, switched both carb and tank, and had to jury rig a governor -- they were quite different. It worked. I replaced the old magneto and points with a new one and electronic ignition, and she fired up pretty as you please. Hauled the logs with it a hundred feet through thick woods to the tractor that got them to the mill. ps. that ghost in the upper right corner is just netting over a blueberry bush. The chipmunk likes it because he can munch the berries underneath without fear of hawks! Ha, well at least you cannot say you get bored with nothing to do. Here in OZ i spent the better part of the day setting up some self watering tubs for growing a few veggies. We live in a unit so tubs work great. Finally got fed up with the weather and having to pull my rain hood over in an attempt to keep my noggin dry, then the sun would sneak out and me ed cooked so off with the hood only to repeat the exercise in five minutes. Ah well got it mostly sorted. Gotta fix the water level float next then maybe I can get back to the play-pen and make swarf. Steve it all sounds horribly familiar! Some days you wonder just how much forward progress is possible when you're working single handed. Well Andrew, it's been quite a wait between reports! Last year during construction it rained enough over the summer that the cistern kinda lost interest for me. Of course this year we're in a bad drought right now, with no end in sight until fall, so I'm wishing I had finished it, and it had 3000 gallons in it now! Our spring fed household supply has ended, and we're using bottled water. The drought is so bad right now that Broad Brook which flows though our property has practically stopped, and I expect it will cease to flow, possibly by tomorrow. There will be a lot of dead fish in that case, and I won't be able to water the veggie garden any more either. Oh well. Anyway, I've been working on the waterball (as we call it) non stop for a few weeks. It's taken thousands of metal ties to secure the lath and chicken wire, and form it to the rebar. The heat has been bad with the clear blue skies and drying winds, and working upwards alot, and the glare on the wire, it's really tough on my eyes. This has NOT been my favorite project -- meat hooks everywhere, It's like working on 250 square feet of barbed wire cloth. Can't wait to get it over with. I'm finished with most of the wire tying now, and looking forward to plastering with cement plaster as a change. Have a bunch of helper friends lined up for the big event. I guess I'll have to haul water in if it doesn't rain and fill the creek up a little. There's a temporary hatch in the side to pass the plaster inside. 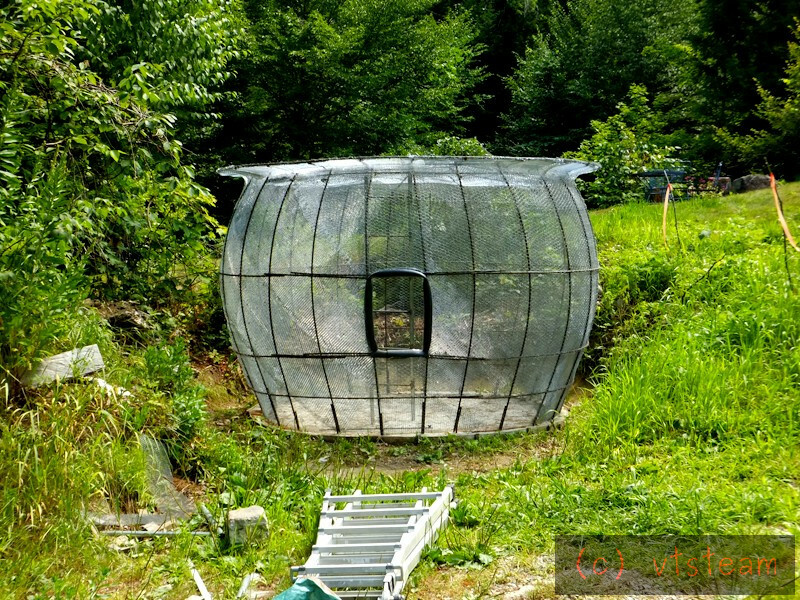 A permanent hatch on top, and a built in ladder. I may do some pre-cementing of the lip near the upper hatch so it's strong enough for climbing in and out on the big plastering day -- and to cover some of the meat hooks there. You need one of those cement slurry pumps that they spray cement onto tunnel walls to stabilise them.(Spraycrete). Are you incorporating polyester fibres to limit initial setting cracks? Hi Steve, good to see you moving ahead on this ! I have missed your postings period ! Norman , we still have at least two of the concrete barges used as mooring/service areas for WW2 seaplanes in the Menai Straits. One of them is currently in Port Penrhyn (Bangor) and still afloat ! Hi Nathan! Sorry I haven't had much to post here this last year, as I've done little mechanical work worth mentioning. I'm getting the itch again, but this darn project is holding me back from doing anything else. Oddly, and I mean oddly, my father taught pontoon bridge building across Menai Straights. The story is thus. He was an under age volunteer in WW1 and wanted to join the then Royal Naval Air Service- but was refused. So he was a blacksmith/farrier and posted to train as a Royal Engineer - on Anglesey- probably Beaumaris. There was horse transport- shades of WarHorse, and a good nag was placed with one less willing. One day, neither were willing and young Dad was told to get the so and so's moving. Dad obliged by putting straw under the horses- and lit it. Rapid exodus! Finally, those in charge stopped raging and the humour returned. Bright young man was kept on training other recruits that would end up- and I mean end up in France. We all know what happens to sappers. For 4 years, Dad enjoyed the added rations of skate from the muddy shores and rabbits cooked in tin bath tins- or so he said. I suppose that one needs a warped sense of humour. odder still, there is comedian called Atkinson. I'm assured that the same village in County Durham is the key. 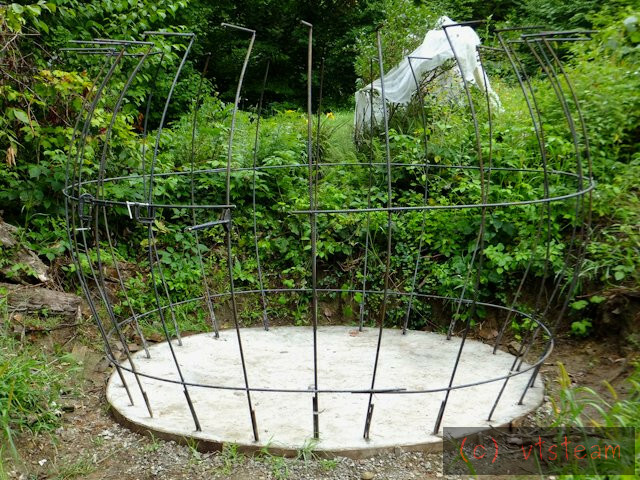 I was planning on doing the rim, and a small area around the top hatch before calling on volunteers for plastering, to get some practice with this armature and cement plaster mixes. Thought I'd mix up a five gallon batch in a plastic bucket. This would give me a chance to mix with my 30 year old Sears Craftsman 1/2" "industrial" electric drill. It's a heavy monster -- all metal body (no plastic), 450 RPM, and it will rip itself out of your hands easily (and probably break an arm) if it gets stuck. I hardly ever use it, in this day of rechargeable plastic bodied drills. But mixing concrete in a bucket seemed like a job for it. But when I went to tighten the chuck, the Jacobs spun freely. I couldn't even turn the chuck key without the whole thing turning What the....? Long and short of it was, the main drill arbor was snapped clean through -- just back of the bearing behind the chuck. This has needle bearings throughout, by the way, I noticed. What do I do now. How did it break? I don't remember an accident last time I used it. Didn't remember lending it out. A mystery. Anyway, it was a 30 year old boat anchor, now. Unless I wanted to try to make a new spindle for it. After lunch I was checking the weather on the computer, and decided what the heck, go to Sears website (they still have one? ), and type in the model number. Bam, I' seeing an exploded parts diagram of my drill, and a list of part numbers, with photos of almost every part in the drill. And prices. There's the spindle, too. Thirty bucks, and in stock! So I sent for it. Amazing! My Grandad was also a trained farrier, got into WW 1 as a corporal in the Royal Engineers and survived. He was a foreman smith and ended up responsible for building road bridges and the platform extension at the main station!! how's the build progressing given the possible need to live off the land for the duration of the US election fall out?? What witt all the concrete being needed for wall building or concrete overcoats for the main participants ? Steve hasn't dropped by since early August.. I hope he's ok.
Howzitwork You have that right, there is a shortage of pitchforks, the land is being contaminated with to much unnatural fertilizer. We cannot shovel it fast enough and cannot seem to give it away. Sounds like a concert brewing " welcome to shitefest " but on the bright side Trump can always write off the cement for crazy eyes cell! But if you want to trade Trump for Trudeau that would work for us. In the United States, the majority undertakes to supply a multitude of ready-made opinions for the use of individuals, who are thus relieved from the necessity of forming opinions of their own. Maybe you guys could keep the political stuff away from this site ? I've just been looking at two sites I used to enjoy and they have both been ruined by political infighting. A couple of days and the decision will be made.